White House Staffer Repeats Baseless Claims Of Voter Fraud In New Hampshire : The Two-Way No evidence supports the Trump administration's claim that the presidential election was marred by massive voter fraud. But White House adviser Stephen Miller doubled down on the allegations Sunday. Voters went to the polls at Amherst Street Elementary School on November 8, 2016, in Nashua, N.H.
White House adviser Stephen Miller doubled down on the Trump administration's groundless claims of voter fraud in New Hampshire — and across the nation — during in an interview on ABC's This Week on Sunday. Earlier this week President Trump claimed, with no evidence, that voters from Massachusetts were bused to New Hampshire to vote illegally. A member of the Federal Election Commission called it an "extraordinarily serious and specific charge" and asked Trump to "immediately share his evidence with the public." On This Week, host George Stephanopoulos asked Miller, a senior White House policy adviser, to provide that evidence. In fact, he asked three times. "I can tell you that this issue of busing voters into New Hampshire is widely known by anyone who's worked in New Hampshire politics. It's very real. It's very serious." 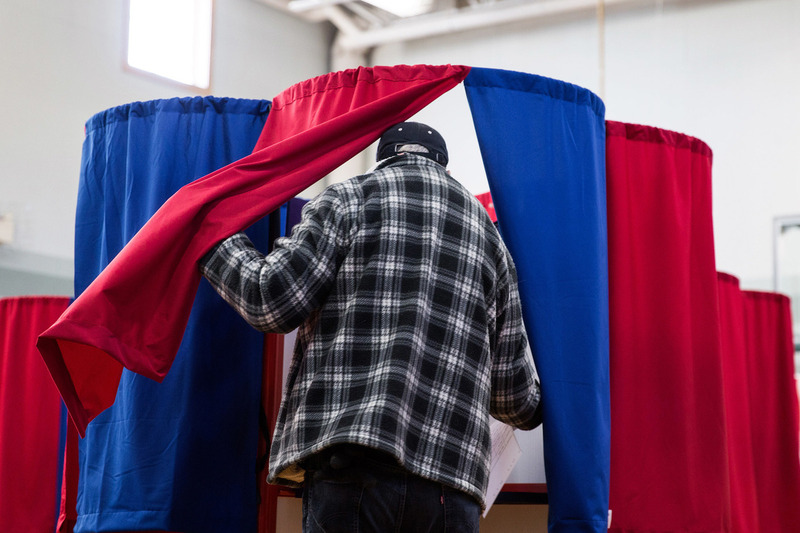 New Hampshire's secretary of state has said there is no proof of buses appearing at polling places, and that a large number of voters arriving like that would have attracted attention. As Politifact noted in November, New Hampshire law requires voters to either show valid ID or have their photo taken and sign an affidavit swearing to their identity. If they sign the affidavit, a confirmation letter is sent to their address to check that it is correct. The New Hampshire voting fraud claims are a variant on a frequently repeated Trump claim of nationwide voter fraud — which is also unfounded. "The White House has provided enormous evidence with respect to voter fraud, with respect to people being registered in more than one state, dead people voting, noncitizens being registered to vote. ... I'm prepared to go on any show, anywhere, anytime, and repeat it and say the President of the United States is correct 100 percent." The White House has not provided "enormous evidence" of massive nationwide voter fraud. Trump has repeatedly claimed that widespread fraud in the 2016 election led to "millions" of fraudulent votes, causing Hillary Clinton to win the popular vote. As NPR has reported several times, there is no evidence to support this allegation. "This is not true, no matter how many times Trump and his surrogates repeat it," NPR's Jessica Taylor and Danielle Kurtzleben reported on Jan. 29. "The administration has never provided proof of this claim." "One, an analysis of survey data published on the Washington Post's social-science blog, Monkey Cage, estimated that "6.4 percent of noncitizens voted in 2008 and 2.2 percent of noncitizens voted in 2010." However, that study drew heavy criticism from other scholars, who saw weaknesses in the authors' methods and the survey they used. "In addition, one of the authors of that heavily criticized study himself later rejected attempts to use that study to prove fraud.
" 'On the right there has been a tendency to misread our results as proof of massive voter fraud, which we don't think they are,' wrote Old Dominion University political science professor Jesse Richman in a blog post. "In another post, he further pointed out that even if one did extrapolate from his study, it does not imply that illegal votes would have affected the outcome of the 2016 presidential election, because it simply was not a close election. Though Trump won the electoral vote, Hillary Clinton won the popular vote by nearly 3 million votes. "Miller also cited a 2012 Pew Charitable Trusts report on the state of states' voting systems. And that report did reveal some troubling statistics. For example, it found that 2.8 million people are registered to vote in more than one state and that 24 million registration records "are estimated to be inaccurate or no longer valid." "That means voting systems could definitely be modernized in some ways. "However, that is not at all evidence of fraudulent voting, as the study's main author pointed out on Twitter." You can read a more in-depth analysis of both the Monkey Cage post and the Pew survey here.